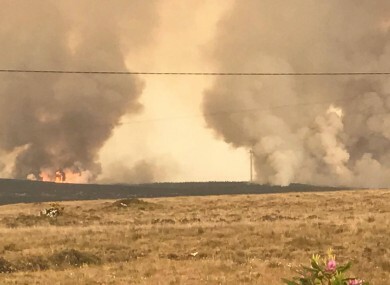 THE ARMY ARE being deployed to beat back the massive forest fire which has destroyed over a third of the forest at Cloosh Valley in Galway. Cloosh Valley is Ireland’s largest forest, at over 4,000 hectares. Coillte and Air Corps helicopters are being used to fight the blaze, one is directing operations and the other is using bambi buckets to douse the land with thousands of litres of water. Firefighters are working to try to protect homes in the area and are currently working on three separate fronts on the ground. The fire is visible from Galway city and there is even a smell of burning, although the site is 20 miles away. Gardaí have asked members of the public to refrain from entering the Cloosh Valley area, saying people and vehicles are posing difficulties for the emergency services. In particular, they said the Seanafeastin Road should be avoided, except for use by emergency service vehicles and local residents as it is dangerous to enter and there is a possibility of becoming trapped. Coillte staff, the fire service and Army and Air Corps have been fighting the blaze for several days now. It is believed the fire was caused deliberately and spread onto Coillte property. Trevor McHugh of Veon, a leading forestry company and a member of the Irish Forestry and Forest Products Association (IFFPA), said: “The lighting of wildfires is causing widespread devastation. It is illegal and must stop before an even bigger tragedy occurs. The fires that have already occurred must be thoroughly investigated. Thousands of jobs rely on Ireland’s forestry sector and, beyond this, Ireland relies upon its rural environment for agriculture, tourism and recreational purposes. These fires are a threat to all of this. In a statement yesterday evening, government ministers reminded landowners that it’s an offence to burn any vegetation growing on any land not cultivated between 1 March and 31 August. Coillte has said it is battling fires on its land at 30 locations in Leitrim, Roscommon, Mayo and Cavan. A combination of dry weather, dry vegetation and windy conditions have led to an increased risk of gorse and forest fires in recent weeks. According to Met Éireann, the dry spell is set to break tomorrow. Email “Over a third of Ireland's largest forest has been destroyed by gorse fire ”. Feedback on “Over a third of Ireland's largest forest has been destroyed by gorse fire ”.